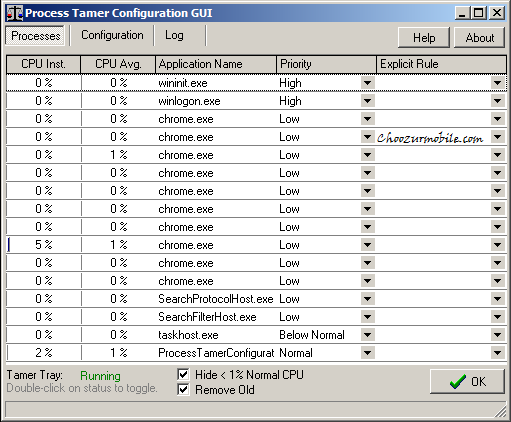 Process Tamer is a small utility which runs in your system tray and monitors the CPU usage. When CPU gets overloaded, it reduces the priority of that process temporarily and waits for its CPU usage returns to a reasonable level. As you know, most of the new free apps and softwares have poor memory management. Sometimes they choke CPU speed and hog almost all the CPU power. Either you can close those program or kill in the midway. Process Tamer offers a decent alternative. To enhance computer's loading, most of the time we rely upon the RAM without focusing much on CPU's load. A function of CPU can also affect the computer's speed and its response. Even though you have installed huge RAM on your pc, there are some processes which directly affect CPU speed such as desktop manager, windows idle process, and many other ongoing utilities. This makes a pc run slower, to remain hotter and create lag in the operation. Keep your PC away from system overload - Process Tamer, yes, a freeware can nicely handle this hassle, temporarily reduce the priority of those offending processes and allow the system to focus on other necessary requests. You may also like "How to limit website access on your home computer"
You will notice a balloon tooltip in your system tray which will keep notifying you what operation is being prioritized and what's going back there. It also has a new version which can allow you adjust setup exclusion rules, manually adjust process priorities and much more. It's a standalone configuration tool which will allow you set things without affecting the efficiency and resource use of the resident system tray tool. Note: To obtain a free limited license you need to go to this link.